About me I am over ten years experienced trader of derivatives and forex. I have also Master degree in banking: risk management and derivatives. 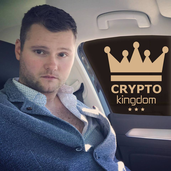 Nowdays i lead group of 24/7 crypto leverage traders to rule the market! POE is located in very strong daily support. We can se change of the mood. First profit is PoC, second profit almost 100 %. Enjoy the ride! Bitcoin is right now between two PoCs it means very important next few hours. In my opinion btc is accumulating capital to push price higher. After strong impulse BTC is capable of keeping the price around 5 000 USD. This action is very important to move higher. We are growing almost 6 weeks. No strength to push btc higher. BNB to the moon right now... I HODL BNB from 6 USD. Put limit order into 12 USD price and wait for it. Great still active support - wait for pump from it. We are waitting for next swing trade to hit new high of uptrend. We are looking for the new way of bitcoin. Price is still in this triangle. Whales are managing price all the time. This is reason why altcoins can fly next weeks. Trendy Cardano is waiting for next impuls to get higher price. Amazing and proper triangle has been already formed! Watch the chart! This is chinese pump coin. We are looking for great momentum. Here it is!